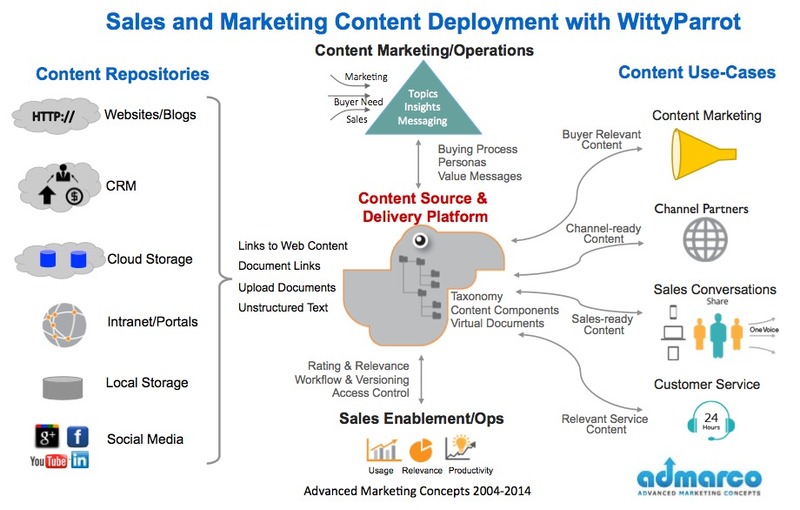 Visual confections, such as the WittyParrot Sales and Marketing Content Creation Deployment story shown below, are powerful sales aids as they include visual images, text, numbers and a story and represent a superset of information that includes the buyer condition, your value proposition and relevant proof points that reinforce the story. At the appropriate point in the sales call, if salespeople place a high quality A3 (11"X17") visual confection on the table, display the image on their tablet, (or direct a buyer over the phone to a specific page on their Website), buyers will focus on their areas of interest in the visual and conversations will follow. Tufte advocates that the most powerful way of communicating ideas, whether in a church committee or a sales interaction is with a superset of the data that will hold some interest for the viewer. In this way meetings can be shortened by 30%. A Visual confection drawn on a Whiteboard can be used at a trade-show for effective engagement, presentation and qualification of interest in an elapsed time of about 3 minutes. 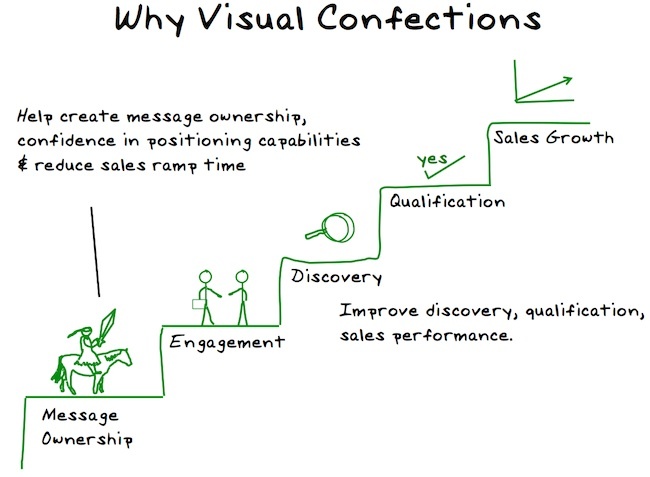 Inside Sales professionals can regain the visual aspect in communication with prospects using visual confections. An example of how a buyer can be quickly referred to a Website to view a visual confection to simplify a complex concept without the need of video conferencing and screen sharing; - "Mr. prospect, are you in front of a computer?, if you could please key in www.admarco.net/visual-confections, we can explore this concept together"